Finally! I’m ready to provide details for the rockhunts coming up in April. I apologize to all who have emailed and called asking for these details, but I needed to take some time and explore the South Larremore Ranch before I could tell you what is to be found there, and before the Larremores could set a price for the rockhunts. I was out at the South Larremore Ranch last Saturday, Thursday and today, and I found quite a variety of agates and other goodies. I’ll include details about the South Larremore Ranch at the end of this email. The Ritchie Ranch is $10 per person entrance fee, and $1 per lb. for the agate and quartz crystals you take with you. 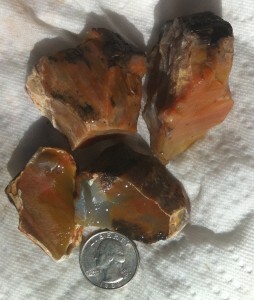 I’ve found a new agate piece at the top of the hill where my “big rock” came from, and I have no idea how big it is. If you want it, you just have to dig it out and pay for it! Payment can be by cash or check. South Larremore Ranch is about 45 miles south of Alpine on Highway 118. It’s 2,500 acres that was once part of Rex Ivey’s ranch, which is now subdivided and called East Rim Ranch. 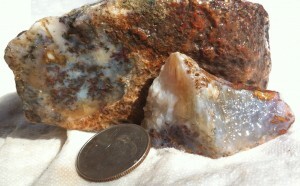 The ranch is flat, and consists of alluvial deposits containing many types of quartz stones. 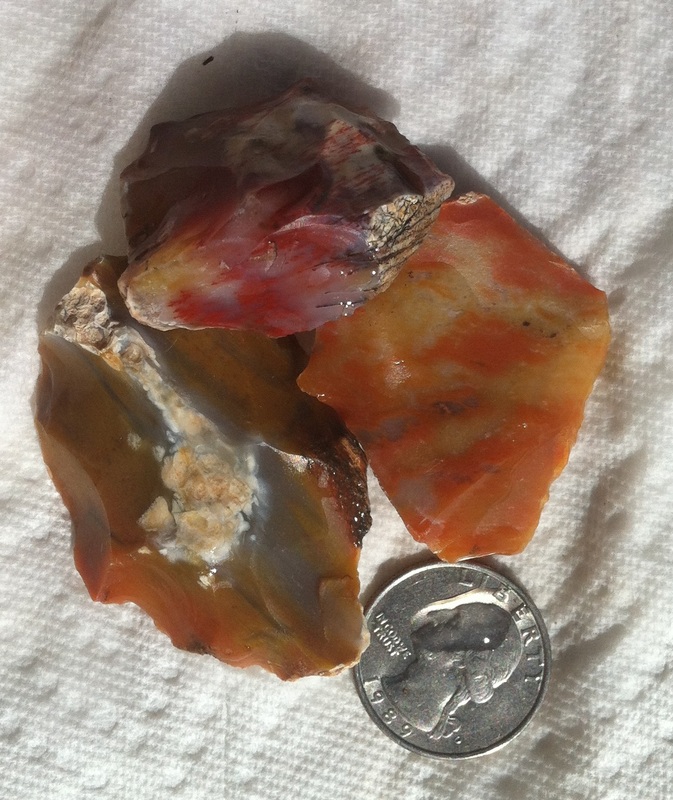 I have wandered around on this ranch for three days, and have found agate, including moss agates, fortification agates, and plume agates; petrified wood, some of which is completely agatized in beautiful colors; jasper in all colors of red from orange to purple, along with yellow, orange, and green; and flint and/or chert in nodules of different colors. 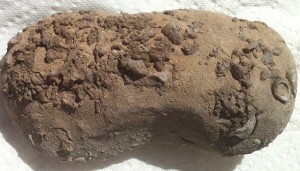 There are also some shell fossils, and some interesting things I call “Terlingua Nodules” that appear to be at least partly agatized on the outside, and often are filled with calciferous mud on the inside. The cost for this ranch will be $40 per person. East Needle Peak is $40 per person per day. On my last trip down there, a couple of months ago, I found a 16 lb. chunk of green moss with pompoms in it, and a 5 lb chunk of clear petrified wood with yellow and orange inclusions. The only reason I could identify it as wood is because the exterior of the piece showed the rings and bark of the original wood. The Singleton Ranch is $50 per person per day, cash only. More details can be found on my website. All of my field trips require that you join the Rollin’ Rock Club. The fee for that is $10 single or $16 dual membership for the calendar year 2015. To summarize: I need at least half your fee for the Walker Ranch hunts to secure your place. And I will need 20 participants to ensure that the hunts occur (we’ve never had a problem with getting 20 people!) If you want to get an extra “free” day, send your entire fee to me by March 15. You don’t need to send me a deposit on the other ranches. Simply send me an email telling me which days/ranches you wish to hunt on, and I’ll put you on the list. All hunts begin at the Antelope Lodge, 2310 W. Highway 90, Alpine. Specifics about each hunt’s starting time will be sent in an email in about a week or so. All the ranches I lead field trips on have a good quantity of agate on the ground. This occurs because the basalt, where the agate grows, erodes, but the agates don’t, so they’re left in the dirt. Generally, all you need to do is pick them up. The more difficult ones may require you to dig in the soft dirt. My basic equipment list is this: a table knife, like the ones you can get at a dollar store or thrift store. Stainless steel, all one piece. You use this to dig in the dirt around an agate and pop it out. Next, a chopstick. Use this to clean dirt off of an agate or clean out the inside of a geode so you don’t damage the crystals or mark the agate surface with a metal implement. Third, a toothbrush. This goes with the fourth item, which is a spray bottle filled with water. Use these two together to clean agates to see if they’re what you want. And wetting down an agate helps you see what it will look like polished. Another useful item is flagging tape, which can be used to mark the location where you put your lunch, your bag, or your car, and to mark the location of a rock you want to go back to later. For putting your finds in, I like the bags we used to get when we went to conferences: canvas, with a couple of fairly long handles so they’ll sit on your shoulder. You can find these at thrift stores, garage sales, and perhaps in your own closet. When the bag gets full and you bring it back to the car, you can empty it into a bucket and start over. That way you don’t have to carry many rocks at a time. Of course, you want to have a rock pick, a crack hammer or small sledge, and a couple of prybars in your car in case you find the one in a thousand agate that’s still in the basalt. But you don’t need to carry them with you all the time. You can buy some construction flagging tape and take a piece with you as you hunt. Then you can mark where the great rock is that you need to get out of the host rock, and go back to your car for the tools. A New Ranch is Opening for Rockhunts! 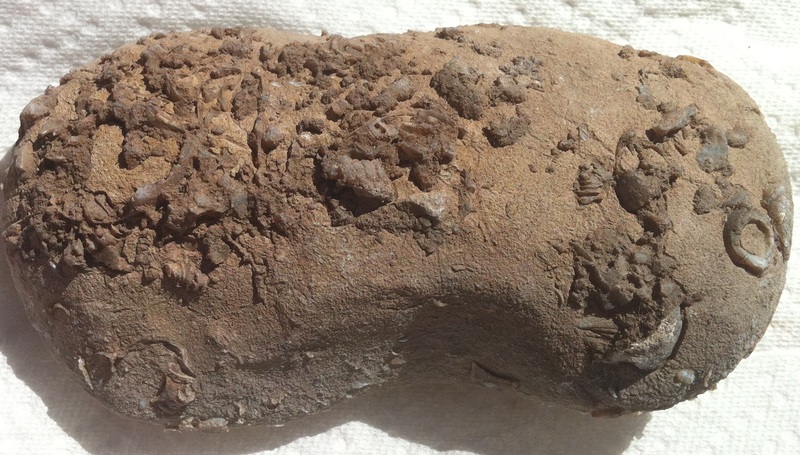 Terlingua Nodules. Could they be fossils of egg masses? Petrified Wood from the South Larremore Ranch. Announcing the opening of a new ranch for rock hunting in the Big Bend of Texas: the South Larremore Ranch. This is an entirely different area than the northern part of the Larremore Ranch, which was open for rockhunting in the past. I was out there yesterday, and I hunted at three different locations within half a mile of each other on the 2,500 acre ranch. One area was full of flint nodules, fossil concretions, and some cool things I call “Terlingua Nodules”. The second area had lovely moss agate chunks and a few pieces of plume agate. And the third area had small pieces of fully agatized wood in great colors. Here are some photos of my finds.More details about field trips on this ranch will be available in about a week. The cold weather is over for a while, and I was out on the Singleton Ranch this last Sunday, on top of Telephone Hill. The rain, ice and snow that we’ve had in the past six weeks has made agate visible everywhere. The grass has not yet begun to grow, and the pickings are very, very good. The same applies at the Ritchie Ranch, and I’m sure it applies to the Walker Ranch as well. I’ve got Singleton Ranch rockhunts scheduled for the second and fourth weekends in February and March. If you have a chance to come out in February and March, the weather should range from cool to moderate. In other words, just about perfect for rockhunting. The schedule for the Singleton Ranch hunts will be modified in April, when the Walker Ranch hunts occur. The second and third weeks of March are Spring Break for most schools in Texas. I’m scheduling special hunts for families with kids at the Ritchie Ranch during these weeks. The hunts will be Monday, March 9, and Wednesday, March 11; and again the following week on Monday, March 16, Wednesday March 18, and Friday, March 20. The hunts will be about half a day long, and start at 10 a.m. at the Antelope Lodge in Alpine. For details, look at my website at www.terismithrockhunts.com. The special April rockhunts will begin on Tuesday, April 14, which is the week of the Gem and Mineral Show in Alpine. There won’t be any hunts the weekend before that because I’ll be out of town for my husband John’s 59th high school reunion in Goliad. The hunts at the Walker Ranch will probably begin Wednesday, April 15 and continue through Monday, April 20. After that will be hunts to the Singleton Ranch, the Ritchie Ranch and East Needle Peak. One of the reasons I haven’t finalized the schedule is that I’m looking at a brand-new ranch this weekend. If there is lots of agate on this new ranch, it will impact the schedule for the days after the Walker Ranch hunt. The ranch is located between Highway 118 and Highway 385, close to Santiago Peak, so it may have agate that’s different from any of the other places where I lead field trips. I’ll let y’all know early next week. This year, another event is also taking place in Alpine on the same weekend as the Gem Show and Walker Ranch Rockhunts. It’s a show at the Museum of the Big Bend entitled Trappings of Texas. It’s been held for many years, but until this year it was in February, concurrent with the Cowboy Poetry weekend. What this means for rockhunters is that lodging in Alpine is going fast. So as soon as you decide that you wish to come out for the rockhunts, consider booking a room.